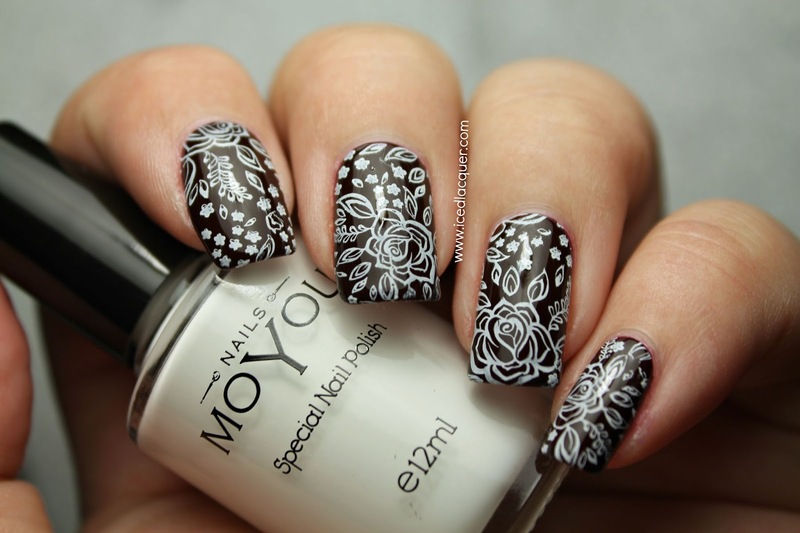 While Courtney and I were at Cosmoprof we had the opportunity to meet with MoYou nails! So today I thought I'd write up a little review about one of the plates I was sent home with and their special white stamping polish! The plate I chose to try firs is #301 and it's a full image plate, meaning you can pick any section to stamp from. As you can see this one features Tinkerbell, a snowflake-like pattern behind her, some glittery stars, unicorns, and roses. I stamped right on top of Leighton Denny "Vamp", which I swatched last week. I decided to go for the section with the roses. 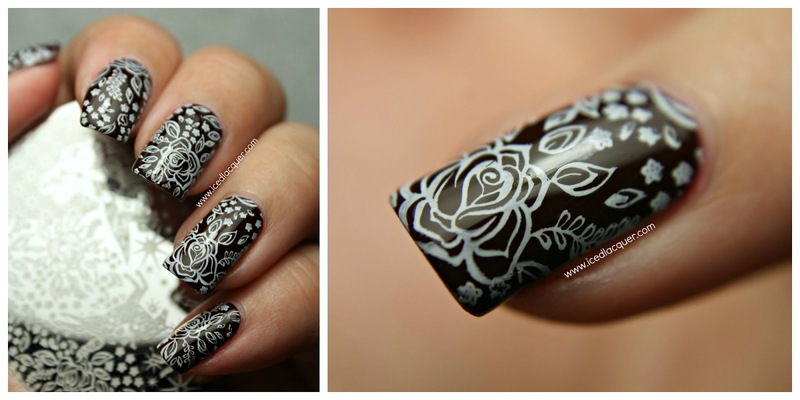 The white stamping polish was very easy to work with and I felt like the design I picked up was nice and crisp. I used their new, squishy rectangular stamper, which also worked very well for image transferring. I think I prefer my larger, round stamper just so I'm able to pick up more of the image, but this one is definitely miles ahead of the tiny old round stampers that I started with years ago. I felt like with this white polish I had some additional time to go back and add a little piece of the stamp that didn't make it onto one section of the nail, which was especially nice. My opinion: As I said above, I'm really impressed by this white stamping polish. It was thick but still easy to work with and provided a crisp image. It also didn't dry immediately, which allowed me to have some wiggle room when placing my images on the nail. Full image plates like this aren't always my favorite simply because if you want each nail to be exactly the same (I love symmetry) then you'd essentially have to tape off a section so you know you're getting the same image each time. For someone who isn't as indecisive as me (I seriously spent a good ten minutes trying to pick a spot to pull an image from) this is a great plate. Image design aside, the actual performance of the plate was perfect. The image is etched cleanly and deep enough to give a nice, consistent stamp. 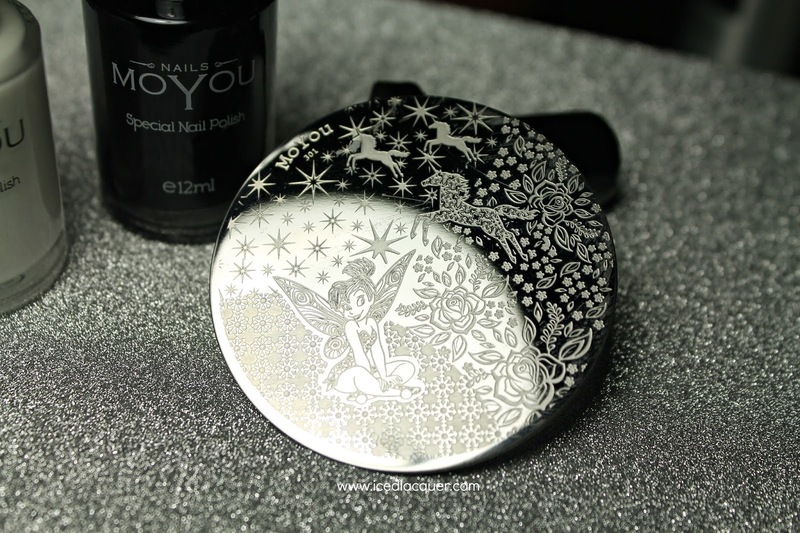 I do have a couple more plates to try out as well as a black stamping polish, so keep an eye out for those! These are gorgeous! I am the same way with full-image plates, but I always adore how nails look when stamped with a coordinating but not matching image.